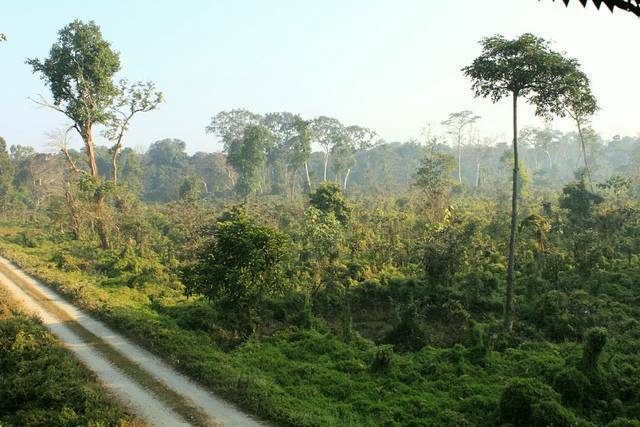 Chilapata Forest is a dense jungle area right in the middle of Eastern Dooars, near Jaldapara Wildlife Sanctuary in Jalpaiguri District of West Bengal. Chilapata is famous for the one horned rhinoceros but animals like Leopards, Elephants & Wild Boars are also present in this area. Bedsides more tha 20 species of snakes are found here and the large variety of butterflies found here is also quite famous. Notorious for dacoits till few years ago, Chilapata is now very safe for tourists. Nearest town New Alipurduar is about 20 KMs away. Tourists can visit stay at Mendabari Jungle Camp at Kodalbasti which is run by West Bengal Forest Development Corporation (WBFDC). Chilapata is open from October to May. Other attractions nearby include Buxa Tiger Reserve, Jaldapara wildlife sanctuary and Khayerbari Leopard Rescue Centre.